If only George Orwell could see us today. 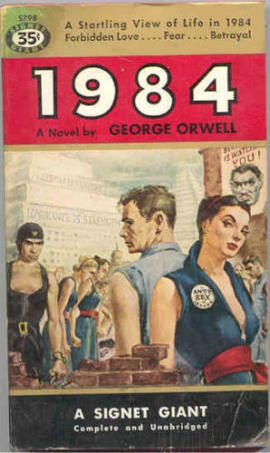 When he wrote “1984” back in 1948, he probably never imagined that the “totalitarian, bureaucratic world” that he imagined would ever actually become a reality. But that is precisely what is happening. We live at a time when the government monitors billions of our phone calls and emails and hardly anyone gets upset about it. We live at a time when corporations systematically collect our voiceprints and our televisions watch us. We live at a time when reporters that try to dig into the misdeeds of the government have their computers hacked, and when nearly one out of every three Americans has a file in the FBI’s master criminal database. The control freaks that run our society are absolutely obsessed with watching, tracking, recording and monitoring virtually everything that we do. We truly are becoming a “1984” society, and if we continue on the path that we are currently on eventually our world will be transformed into something more hellish than anything that George Orwell ever imagined. The federal government has significantly expanded undercover operations in recent years, with officers from at least 40 agencies posing as business people, welfare recipients, political protesters and even doctors or ministers to ferret out wrongdoing, records and interviews show. At the Supreme Court, small teams of undercover officers dress as students at large demonstrations outside the courthouse and join the protests to look for suspicious activity, according to officials familiar with the practice. At the Internal Revenue Service, dozens of undercover agents chase suspected tax evaders worldwide, by posing as tax preparers, accountants drug dealers or yacht buyers and more, court records show. The extent of those secret operations within the departments can be so high that it leads to severe overlap, such as one undercover agent investigating an alleged criminal, who also turns out to be a fed on duty, law enforcement officials said. Silk added that in some instances, agents even draw weapons on each other before realizing they are on the same side. The government also uses a vast array of electronic methods to spy on all of us. The U.S. Department of Justice is putting devices that emulate cellphone towers in Cessna aircraft and flying them around the country to track the locations of cell phones, a practice that targets criminal suspects but may also affect thousands of U.S. citizens, according to a news report Thursday. The program is run by the Department of Justice’s U.S. Marshals Service and has been in operation since at least 2007, according to the report in the Wall Street Journal, which cited two unnamed sources. The aircraft are flown out of at least five metropolitan-area airports and can cover most of the U.S. population, it said. Cell phones are programmed to connect to whichever nearby cell tower has the strongest signal. The fake cell towers trick phones into thinking they have the strongest signal, then read the devices’ unique registration numbers when they connect, the Journal report says. And of course this is just one example of how the government uses technology to monitor us. For quite a few more examples, please see my previous article entitled “15 Signs That We Live During A Time Of Rampant Government Paranoia“. At this point things have gotten so bad that even our public schools are training our children for life in a “Big Brother” police state. Lauren Marionneaux, a seventh-grade student at Jewett Middle Academy, said it was about 9 a.m. Thursday when the principal announced the school was going on lockdown. Students huddled into classrooms waiting for further instructions. Instead, they started hearing voices in the hallway. Two police officers burst into Lauren’s classroom with their guns drawn — one carrying, what Winter Haven police said, was an AR-15 rifle. Would you want your little girl to feel like she is about to die? But this kind of thing is done to condition our young people to life in a police state. They are going to grow up thinking that it is normal for heavily armed men in dark suits to storm in and lock everything down. Even though we are not in prison, we are being systematically trained to act as if we were. Our police forces are being increasingly militarized, and all law enforcement authorities are now trained to bark orders at the general public and treat them like dirt. Most of the population fears those in authority these days, and that is precisely how those in power want it. For example, police arrested Chaumtoli Huq because she failed to promptly comply when ordered to “move along” while waiting outside a Ruby Tuesday’s restaurant for her children, who were inside with their father, using the bathroom. NYPD officers grabbed Huq, a lawyer with the New York City Public Advocate’s office, flipped her around, pressed her against a wall, handcuffed her, searched her purse, arrested her, and told her to “shut up” when she cried out for help, before detaining her for nine hours. Huq was charged with obstructing governmental administration, resisting arrest and disorderly conduct. Oregon resident Fred Marlow was jailed and charged with interfering and resisting arrest after he filmed a SWAT team raid that took place across the street from his apartment and uploaded the footage to the internet. The footage shows police officers threatening Marlow, who was awoken by the sounds of “multiple bombs blasting and glass breaking” and ran outside to investigate only to be threatened with arrest if he didn’t follow orders and return inside. Eric Garner, 43 years old, asthmatic and unarmed, died after being put in a chokehold by NYPD police, allegedly for resisting arrest over his selling untaxed, loose cigarettes, although video footage of the incident shows little resistance on Garner’s part. Indeed, the man was screaming, begging and insisting he couldn’t breathe. And what was New York Mayor Bill De Blasio’s advice to citizens in order to avoid a similar fate? Don’t resist arrest. Yes, we still have a bit more freedom than the poor souls in George Orwell’s “1984“, but our liberties and freedoms are eroding a little bit more with each passing day. And just like in “1984”, most of the population has come to accept the status quo as the new “normal”. So is there any hope that we will wake up, or will our society continue to march toward oblivion?